Welcome to the Paralegal resume sample and writing tips page. Here, you can learn how to sharpen your resume and land more interview callbacks. Not the resume you’re looking for? Browse our huge library of resume examples. Don’t enjoy this template? Then find a resume template that’s more to your liking. If you’re also looking for some cover letter help, check out our expansive cover letter collection for some much-needed pointers. Paralegal graduate with 2 years of experience, specializing in preparing affidavits, briefs, legal correspondences, and other legal documents. Organized, hard-working individual seeking to apply academic training under an attorney for hands-on work experience. Interested in working for a boutique law firm with a focus on criminal defense or personal injury. Organized and copied exhibits for 3 major cases; currently assist senior paralegals with Bates Stamping their exhibits for any upcoming trials. Improved filing database by systematically arranging litigation files and introducing an improved file-opening checklist, resulting in a 15% reduction in the time it takes to catalogue new cases. Schedule and conduct interviews with clients and professionals to discuss details and nature of each case. Prepare and file affidavits, legal correspondence, and other legal documentation for in-house attorneys and partners. Experienced with filing pleadings and preparing wills, appeals, contracts, and briefs. Identified laws and court decisions relevant to client cases by reviewing legal publications and performing database searches. Organized and maintained company’s law libraries, case files, and various legal documents. Assisted in mailing, faxing, and delivering company’s documents and correspondence with clients, court officials, and witnesses. Prepared and processed over 100 summons, complaints, motions, pretrial agreements, subpoenas, and other legal documents. Attended annual, non-compulsory in-house training and improvement sessions to remain up to date on industry best practices and policy. The Bureau of Labor Statistics states that there were 279,500 paralegal positions in 2014; that figure is expected to increase by 8% over the next ten years, with an approximate 21,200 paralegals entering the field. The professional experience section of a resume is crucial because it serves as a metric for both your success and potential as a candidate. With a median salary of $48,800 a year, becoming a paralegal is a desirable career path for those interested in the legal field. For an entry-level position, the only educational requirements are an associate’s or bachelor’s degree with a certificate in paralegal studies. They are much cheaper than lawyers and can work in a variety of capacities, making them valuable assets to law firms, corporate legal departments, and government agencies. By narrowing down what you are looking for in a job, you demonstrate to employers that you are ambitious and take initiative. These are key traits that will bolster your resume and your chances of getting the job. If you need more ideas on how to write a career objective, then check out our detailed resume objective guide. In this example, the applicant provided a quantifiable achievement that demonstrates how they contributed to the firm. Using hard numbers to back up your experience shows that you are an asset and will increase your chances of getting the job. Again, we see quantifiable experience that demonstrates competency and capability. This particular bullet point also shows that the candidate is well-versed in a certain aspect of the legal field. Using strong action verbs is also helpful. For example, our applicant enhanced their filing database by “arranging litigation files” and “introducing an improved file-opening checklist.” Emphasis on these words denotes initiative and they make your resume sound more impressive. Want to learn more about how you can best present your skills and certifications? Be sure to check out our additional skills writing guide. 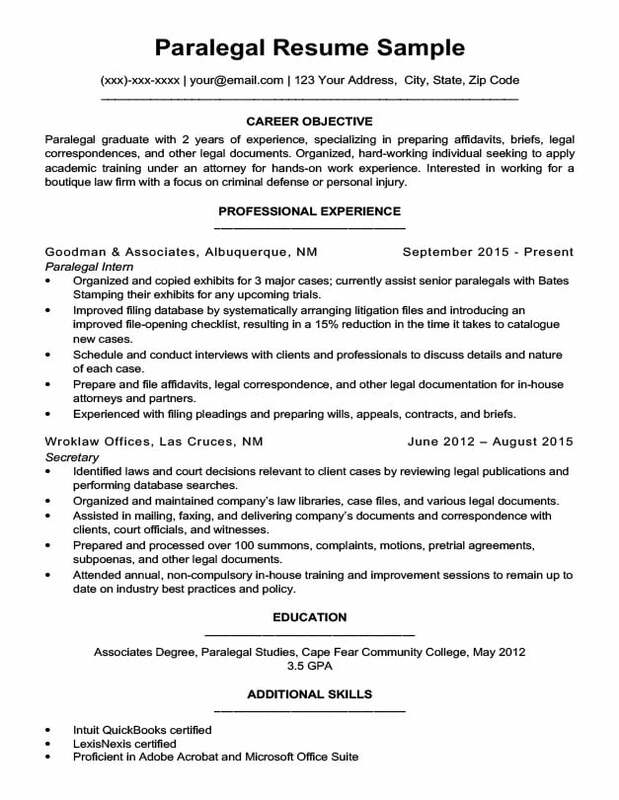 The paralegal resume sample above was created using our resume software. If you need more help writing your resume, then let our resume maker do the writing for you.